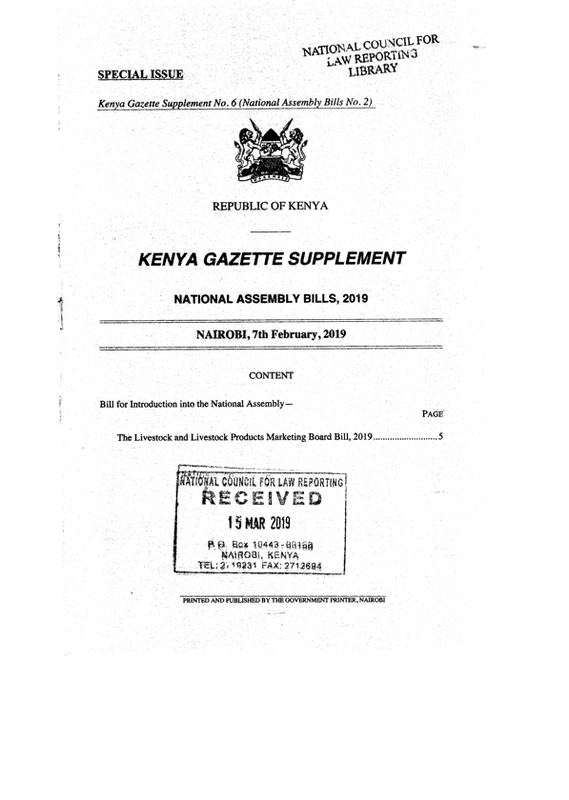 THE LIVESTOCK AND LIVESTOCK PRODUCTS MARKETING BOARD BILL, 2019. 1. This Act may be cited as the Livestock and Live$tock Products Marketing Board Act, 2019. "producer" means a person who rears livestock for purposes of selling the livestock or livestock products. 3. (1) There is established the Livestock and Livestock Products Marketing Board. doing or performing all other things or acts necessary for the proper performance of its functions under this Act, which may lawfully be done or performed by a body corporate. 4. (1) The headquarters of the board shall be in Nairobi. (2) The Board may establish offices in other counties. (r) facilitate, in liaison with county governments and communities, the establishment of strategic business partnerships. (h) the Chief Executive Officer who shall be an ex officio member. (2) The Chairperson shall be appointed by the President with the approval of the National Assembly. (d) has been removed from public office for contravening the Constitution or any other law. (g) is removed in accordance with the provisions of the Constitution. (2) The Board shall be properly constituted notwithstanding a vacancy in its membership. 9. The Chairperson and members appointed under section 6 (1) (d) (e) and (f) shall hold office for a term of three years renewable for one further term only. 10. (1) The Board shall conduct its affairs in accordance with the provisions of the Schedule, but subject thereto, the Board may regulate its own procedure. (2) The Board may establish committees for each produce as may be necessary to enable the carrying out of any specialized activities with respect to the promotion or management of that livestock or livestock product. (3) The membership of the committees shall be drawn from the Board. (4) The committees to be established under subsection (2) shall include a committee on marketing and a committee on consumer affairs. 11. The members of the Board shall be paid such remuneration, allowances and disbursements for expenses as may be approved by the Cabinet Secretary in consultation with the Salaries and Remuneration Commission. 12. (1) There shall be a Chief Executive Officer of the Board who shall be appointed by the Board through an open, transparent and competitive basis. (2) The Chief Executive Officer shall be an·ex officio member of the Board. (c) has not less than five years' experience in the livestock sector. (2) The Chief Executive Officer shall hold office on such terms and conditions of employment as the Board may determine. (f) performance of any other duty necessary for the implementation of this Act as may be assigned to the Chief Executive Officer by the Board. (d) any other ground that would justify the removal from office under the terms and conditions of service. (b) given an opportunity to put in a defence against the allegations. 16. The Board may appoint such officers, agents and staff as are necessary for the proper and efficient discharge of the functions of the Board under this Act, upon such terms and conditions of service as the Board may determine in consultation with the Salaries and Remuneration Commission. 17. The Board may engage the services of such experts in respect of any of its functions in which the experts have special competence. 18. (1) The common seal of the Board shall be kept in the custody of the Chief Executive Officer or of such other person as the Board may direct, and shall not be used except on the order of the Board. (2) The affixing of the common seal of the Board shall be authenticated by the signature of the Chairperson and the Chief Executive Officer. (3) The Board shall in the absence of either the Chairperson or the Chief Executive Officer, in any particular matter, nominate one member of the Board to authenticate the seal of the Board on behalf of either the Chairperson or the Chief Executive Officer. (4) The common seal of the Board when affixed to a document and duly authenticated, shall be judicially and officially noticed, and unless the contrary is proved, any necessary order or authorization by the Board under this section shall be presumed to have been duly given. 19. (1) No matter done by a member of the Board or by any officer, member of staff;or agent of the Board shall, if the matter or thing is done bona fide for the purpose of executing the functions, powers or duties of the Board under this Act, render the member, officer, employee or agent or any person acting on their directions personally liable in an action, claim or demand whatsoever. (2) Any expenses incurred by any person in.any suit or prosecution brought against him or her in any court, in respect of any act which is done or purported to be done by him or her under the direction of the Board, shall, if the court holds that such act done bonafide' be paid out of the funds of the Board, unless such expenses are recovered by him or her in such suit or prosecution. 20. The provisions of section 19 shall not relieve the Board of the ·liability to pay compensation or. damages to any person for any injury to him or her, his or.her property or any of his or her interests caused by the exercise of any power conferred by this Act or any, other written law or by the failure, wholly or partially, of any works. (e) monies from any other lawful source provided for the Board. 22. The financial year of the Board shall be the period of twelve months ending on the thirtieth of June in each year. 23. At least three months before the commencement of each financial year, the Board shall cause to be prepared estimates of revenue and expenditure of the Board for that year. 24. (1) The Board shall cause to be kept proper books and records of accounts of the income, expenditure, assets and liabilities of the Board. (b) a balance sheet of the Board on the last day of that year. 3. The accounts of the Board shall be audited and reported upon in accordance with the provisions of the Public Audit Act. (b) form joint ventures and partnerships between livestock and livestock products co-operatives and private sector with a view of creating opportunities for marketing of livestock and livestock products. (2) The public engagement strategy shall, in particular, identify actions which the public may take to contribute to the achievement of the objects of the Act. (g) any further information relating to the function of the Board. (2) The Board shall submit the report to Parliament. (3) Parliament may at any time require the Board to submit a report on a particular issue. (c) may be .subject to confidentiality requirements of the Board. 28. (1) The right of access to information guaranteed under Article 35 of the Constitution is hereby limited under Article 24 of the Constitution to the nature and extent specified in subsection (2). (2) The Board may decline to give information to an applicant where in its opinion the divulging of the information would compromise the integrity of the Board. 29. In the discharge of its functions under this Act or any other written law, the Board shall in liaison with the Competition Authority ensure that there are no dominant undertakings in the sector as defined in section 23 of the Competition Act. 30. (1) The Cabinet Secretary may in consultation with the Board, make regulations for the better carrying into effect the functions of the Act. (c) the principles and standards applicable to the rules made under this section are those set out in the Interpretation and General Provisions Act and the Statutory Instruments Act, 2013. 31. The National Livestock Development and Promotion Service Order is hereby revoked. 33. All rights, obligations and contracts which, immediately before coming into operation of this Act, were vested in or imposed on the former Board shall by virtue of this section, be deemed to be the rights, obligations and contracts of the Board. 34. (1) Every person who, immediately before the commencement of this Act, was an officer or member of staff of the former Board, not being then under notice of dismissal or resignation shall be an officer or member of staff of the Board. (2) The Chief Executive Officer of the former Board shall be the Chief Executive Officer of the Board and shall serve for his or her unexpired term. (1) The Board shall meet not less than four times in every financial year and not more than two months shall elapse between the date of one meeting and the date of the next meeting. (2) A meeting of the Board shall be held on such date and at such time as the Chairperson shall appoint. (3) Unless the majority of the membership of the Board otherwise agree, at least fourteen days' notice of every meeting shall be given to every member. (4) The Chairperson shall on the written application of at least one-third of the members, convene a special meeting of the Board. (5) The quorum for the conduct of the business of the Board shall be one half of all the members. (6) The Chairperson shall, when present, preside at every meeting of the Board but the members present shall elect one member to preside whenever the Chairperson is absent, and the person so elected shall have all the powers of the Chairperson with respect to that meeting and the business transacted thereat. (7) Unless an unanimous decision is reached, a decision on any matter before the Board shall be by a majority of the votes of the members present and voting, and in case of an equality of votes, the Chairperson or the person presiding shall have a casting vote. (8) Subject to subparagraph (5), no proceedings of the Board shall be invalid by reason only of a vacancy among the members thereof. (1) A member who has an interest in any contract, or other matter present at a meeting shall at the meeting and as soon as reasonably practicable after the commencement, disclose the fact thereof and shall not take part in the consideration or discussion of , or vote on,·any questions with respect to the contract or other matter, or be counted in the quorum of the meeting during consideration of the matter. (1) shall be recorded in the minutes of the meeting at which it is made. (3) A member of the Board who contravenes subparagraph (1) commits an offence and is liable on conviction to imprisonment for a term not exceeding six months, or to a fine not exceeding one hundred thousand shillings, or both. 3. Any contract or instrument which, if entered into or executed by a person not being a body corporate, would not require to be under seal, may be entered into or executed on behalf of the Board by any person generally or specially authorized by the Board. 4. The Board shall cause minutes of all resolutions and proceedings of meetings of the Board to be entered in books kept for that purpose. The principal object of this Bill is to streamline the marketing of livestock and livestock products in Kenya. This is in light of the fact that although the livestock industry is a very important source of income for many households in Kenya, its regulation is carried out by different entities leading·to duplication and competition among the various entities. This results in poor service delivery by the entities and thus the main beneficiaries of the industry are the middlemen as opposed to the livestock farmers. The streamlining of the industry is to be achieved through the establishment of the Livestock and Livestock Products Marketing Promotion Board which is to be the main body dealing with the concerns of the marketing of livestock and livestock products in the country. It is expected that this will result in an efficient livestock and livestock products marketing industry in Kenya. PART I (Clauses 1-2) of the Bill provides for preliminary provisions of the Bill including the short title and commencement of the Act and the interpretation clause. PART ll (Clauses 3-20) of the Bill deals with the establishment, functions and powers of the Board. Clause 3 specifically establishes the Livestock and Livestock Products Marketing Promotion Board. The functions and powers of the Board are outlined under clauses 5 and 7 respectively. PART Ill (Clauses 21-24) of the Bill deals with the financial provisions. The sources of funds for the Board are outlined in clause 21. The' Board is required to comply with prudent financial management systems including the provisions of the Public Audit Act, No. 34 of 2015. PART IV (Clauses 25-30) of the Bill contains miscellaneous provisions. It provides for the requirement of the Board to have a public engagement strategy. It also outlines the guiding principles for the Cabinet Secretary when formulating delegated legislation. The enactment of this Bill will occasion additional expenditure of public funds to be provided for through the annual estimates. Created on April 3, 2019, 3:51 p.m.
Dokeza Masta 2 weeks, 3 days ago. This would mean something if the board had a clear mandate to collect information about the livestock numbers, especially in areas with a large livestock economy.